Villa Calamota is situated on the Island of Koločep, part of the spectacular Elaphite archipelago is a sunny idyll, that still has an “undiscovered” sort of feel about it. It is car free, surrounded by warm, clean Dalmatian waters, criss-crossed by dozens of easy walking paths, has a lovely sandy beach and is inhabited by only 150 locals, yet only within a convenient, easy ferry or speedboat ride from the mainland and the cultural delights of Dubrovnik. The village of Donje Čelo provides a number of charming cafés, a post office, a grocery store, a traditional Croatian wine bar, offering good local food and seafood specialties, a restaurant and a pizzeria, all within walking distance of the villa. 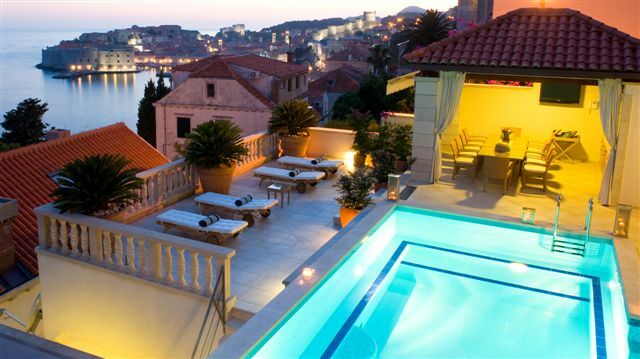 So it is possible to enjoy the great sense of privacy and tranquillity that the villa and island provide, but eat out at local restaurants, or head over to explore Dubrovnik, some of the other islands or even head over to explore the fascinating Montenegro. Villa Motta has stylish interiors blending modern features and amenities with antique furniture and contemporary living space. It is relaxed summer living at its best, up to 8 guests in 3 - 4 bedrooms, all with en-suite bathrooms. Ideal for 1 – 2 families or a group of friends. A 450 m˛ living area in 1,600 m˛ of grounds with aromatic Mediterranean plants, shrubs and herbs, a large 11 x 4.5 m pool with spectacular views, spacious stylish interiors and walking distance into the local village of Donje Čelo. Wonderfully spacious and airy, double doors opening onto the terraces. 3 spacious bedrooms (the largest with en-suite bathroom) all with large, bright windows. Terraces that overlook the gardens and the sea. An additional double bedroom, which opens out onto the gardens / down to the pool area. Price is based on seven nights accommodation with exclusive occupancy of the villa for up to 8 guests. Flexibility in arrival and departure dates, please enquire. N.B. The prices displayed are converted daily from Euros into UK Pounds, and therefore the prices displayed will fluctuate from one day to the next. All quotes will be provided in Euros. • Private chef – Daily service for preparing lovely meals; cooking service is 300 eur/day (food, drinks, groceries are paid separately per consumption). We can create some menu proposals and will arrange everything, so once you arrive you know what to expect.